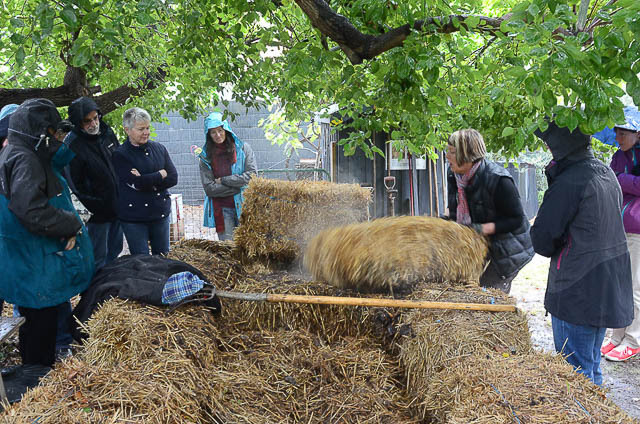 It might have been a tad chilly on the last weekend in Autumn, but the compost heap was steaming and visitors received a warm welcome at Open Gardens Victoria's Cooking Up Compost workshops run by Helena Buxton in Geelong in May. Open Gardens Victoria was thrilled with the attendance at Helena’s workshops, which provided hands-on insights into creating perfect garden compost, or what she refers to as ‘Black Magic’. Despite a little rain for the morning session, visitors were well looked after with spare rain jackets and shelter under large cheery red garden umbrellas. The backdrop to the workshops was Helena’s beautiful and productive garden ‘Arundel’ where good composting and soil improvement has turned a drought-stricken garden into a flourishing oasis. Helena explained that having a good routine with kitchen scraps and the right dry materials on-hand make composting much easier. Attendees were shown the key steps to successfully setting up a hot composting system using hay bales as the perimeter walls and how to correctly layer material to get the most effective decomposition. According to Helena, lawn and shredded garden clippings can still be used effectively in compost-making, but to avoid them becoming slimy and gluggy they need to be applied in thin layers with thicker layers of dry leaves and straw. Helena also explained the cold composting technique using the traditional compost bin and revealed a recently completed bin filled with deliciously dark crumbly compost, ready for digging into the garden. Worm farming was also on the agenda and Helena listed all her favourite kitchen scraps that she saves for her worms. The juiciest leftovers make the best worm fodder, such as fruit peelings, cucumber ends, watermelon and the discards or soft parts of veggies that are past their prime. All this talk of worm food left people feeling peckish and Helena did not disappoint, putting on a superb spread of morning and afternoon tea including sponge cake, divine chocolate cake and cheese scones. Coffee grounds did not go to waste, with everyone handed neatly-labelled paper bags filled with coffee grounds to take home for their worm farms and compost bins. Helena explained that coffee grounds also can be an excellent snail deterrent when sprinkled around the base of vulnerable plants. Look out snails! Feedback from this workshop has been fantastic with requests to run it again next season. Many thanks to Helena and her husband Gerard for running such a well-organised and informative day, and for sharing their home, garden and wisdom with a grateful bunch of gardeners.